By the time Nunavut oil and gas reached production stage, there may no longer be a strong oil and gas market, according to some testimony before the Nunavut Impact Review Board. Action to curb climate change may snuff out Nunavut’s gas and oil development before it even starts. 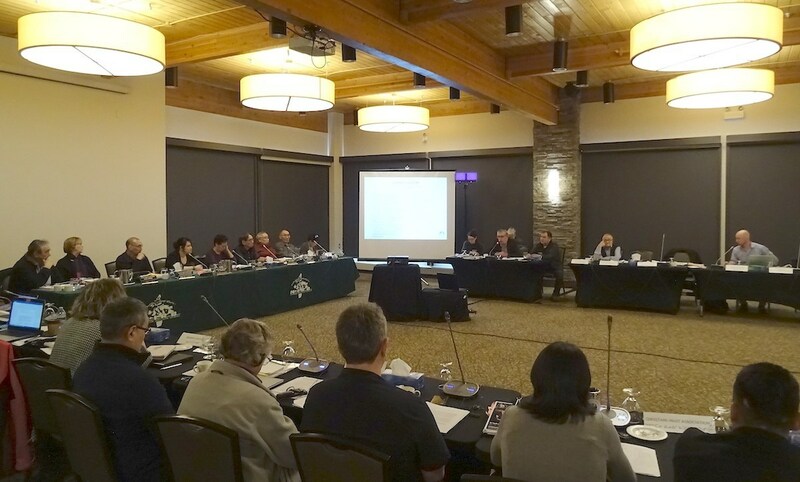 That possibility was raised during a presentation from Nunavut Tunngavik Inc. on Tuesday, March 19, during the second day of the Nunavut Impact Review Board’s final public hearing in Iqaluit on whether such development should go ahead in Baffin Bay and Davis Strait. The NTI presentation considered two scenarios, one with gas and oil development, the other with none. The envisioned development would occur at the Saglek Basin in Baffin Bay, with its Hekja field located about 120 kilometers from Inuit-owned lands on the Hall Peninsula. But there could be a problem. The NTI presentation showed that if the project received a go-ahead in the 2020s, production might not take place until 2055 — and by then the world may have decided to clamp down on the use of fossil fuels, such as oil and gas. As NTI mentioned, the 2015 Paris Agreement set goals to keep any global temperature increase to below 2 degrees Celsius over mid-1800 levels and committed to big emission cuts of climate-warming fossil fuels, like oil and gas, to make that happen. “This will reduce demand for oil and gas and may make Nunavut production uneconomic,” said NTI’s Wayne Johnson, who presented the report at the NIRB hearing. If society succeeds in meeting its goals to cut greenhouse gas emissions, the result will be no oil and gas development in Nunavut, Johnson said. That’s because production would occur in places that are already developed and Arctic projects, with their risks and high costs, would be “written off,” he said. But no gas and oil development might not be that bad: “For example, Nunavut organizations would be able to focus their efforts on other opportunities that may be more viable, such as mining, fishing and tourism,” suggested a document prepared by NTI. NTI’s presentation is one of many that the NIRB will hear this week during its five-day hearing. Presenter Bernie MacIsaac said the GN is not against oil and gas development but would want the control of royalties, jobs and business opportunities go to Nunavut. The Qikiqtani Inuit Association also said development activities shouldn’t take place unless there are “clear benefits and opportunities” for Inuit. By May 31, the NIRB plans to deliver its recommendation on the strategic environmental assessment, or SEA, on gas and oil development Baffin Bay and Davis Strait to Dominic LeBlanc, the federal minister of intergovernmental affairs, northern affairs and internal trade. The federal government imposed a moratorium in 2016 on new oil and gas activities in all offshore Canadian Arctic waters that is scheduled to be reviewed in 2021.